Rayovac charger and new, high capacity batteries. COOREY & Co has announced the introduction of the first one-hour nickel metal hydride (NiMH) battery charger from Rayovac for high-capacity NiMH batteries. Rayovac has also introduced a new high-capacity NiMH battery that lasts at least twice as long as an alkaline batteries. The batteries can be charged up to 1,000 times. Rayovac's new one-hour charger and high-capacity NiMH batteries are designed to meet the power needs of today's high-tech devices, such as digital cameras. 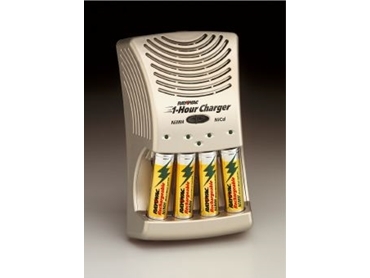 The Rayovac charger features a sleek, high-tech look, and the charging unit is not much larger than many mobile phones. In addition, an accessory kit features a carrying case and dc adaptor that plugs into a car lighter. The charger employs "smart charger" computer chip technology, which allows it to detect the amount of charge in each battery and charge each individually to maximum capacity, without over-charging. The charger will also charge a 9V NiMH battery in three hours and can charge nickel cadmium (NiCd) in addition to NiMH. In conjunction with the introduction of the new charger, Rayovac has introduced high-performing NiMH batteries, specifically for use in the most demanding electronic devices. The AA and AAA size capacities are 1600mAh and 700mAh, respectively. Coorey & Co 02 9890 2500.